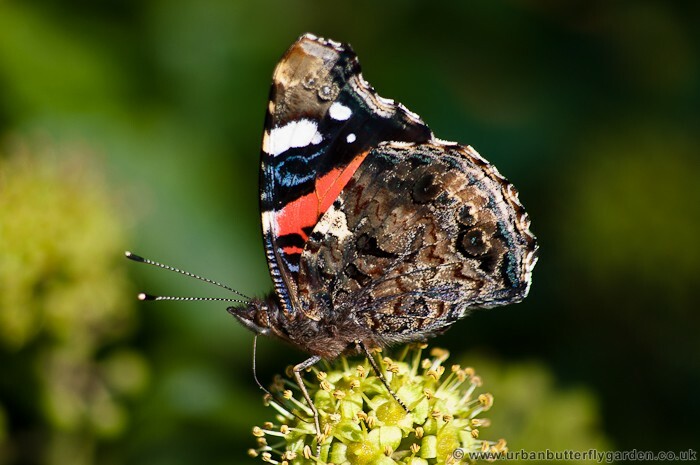 A regular visitor to the gardens, the Red Admiral may be seen throughout the British Isles, often attracted in numbers by nectar rich flowers such as Buddleia and Rudbekia around July to August. Out of the Garden, a sunny sheltered spot with flowering Ivy or Hemp Agrimony, may also attract Red Admiral butterflies, although they are rarely seen in numbers before June. They may even still be seen on the wing till late October – November on sunny days if a nectar source is still available. With a large 60mm wingspan the Red Admiral is a strong flying butterfly, able to glide and manoeuvre after a small number of quick wing beats. The mainly black or brown colouration, broad red bands and white spots on the fore-wings and broad red band on the hind-wings make it easy to identify. The under-wings are a mottled black-brown . 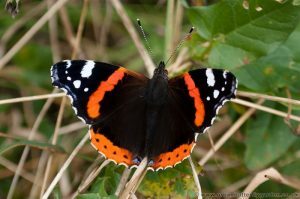 The Red Admiral is seen as a migrant butterfly from Europe, arriving in Britain and Ireland from May-June. It is believed that with the milder winters of recent years, some are managing to hibernate during short cold periods, creating a resident population mainly across the south of England. Caterpillar food plant: Common Nettles.